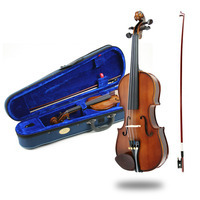 The Stentor Student 2 violin is a higher quality version of the Stentor Student 1 Violin. It comes highly recommended by teachers and those in the education sector as a brilliant teaching instrument and starter violin for any student. Beautifully handmade from selected tonewoods this violin has a solid ebony fingerboard and pegs and is fitted with quality strings alloy tailpiece and adjusters.This particular model produces a deeper richer tone than the student 1 and is a great beginner violin which will see you progress through the early grades. The outfit comes complete with a lightweight case and shoulder strap which have pockets to put all your accessories. 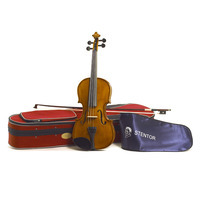 For a little extra the Stentor 2 Violin is certainly offers value for money.The Stentor Student 2 violin outfit is available in 4/4 3/4 1/2 1/4 1/8 1/10 and 1/16 sizes.The Stentor Student 2 will befully set up and checked before delivery so that it is ready to play out of the box. Although we do advise that the bow hairs are tightened slightly and a good amount of resin (supplied) is applied to ensure the best possible sound. A quick fine tune with a digital chromatictuner and you are ready to go! SpecificationsInstrument: Solid carved spruce table Solid carved maple back and ribs Solid carved maple neck Individual hand shaping and finishing Traditional inlaid purfling Correct neck angle Ebony fingerboard Correctly fitted ebony top nut Correctly reamed peg hole taperFittings: Ebony pegs Alloy tailpiece with 4 integral adjusters Adjustable nylon tailgut Teka pattern wood chin rest Bow: Strong wood bow with ebony frog Natural white horsehair Good quality screw eye and ferrule Traditional wedge fitting for hair Case: Lightweight violin case with burgundy red integral cover Fitted interior with accessory pocket Soft velvet type lining Carrying straps Music pocket covering whole lid External shoulder rest pocket Two bow holders Case blanket or bag includedHere's what our customers are saying about the Stentor II Student Violin Outfit: 'Excellent product and a definite step-up from the cheaper and more mass-produced instruments. My son's playing has already improved markedly thankfullyA lovely violin that produces a beautiful soundBought for son who is 9 yrs old and currently doing grade 3 and 4 work with violin. Bought previous violin frm DJM and happy with Stentor I so bought again with them for Stentor II and happy with this too.The second stentor violin we have purchased for our daughter and again the instrument is well made and thoroughly enjoyed by our daughterA beautiful looking violin. Holds its tuning nicely.This was my daughter's second violin - she previously had a 1/16 size Stentor. We decided to pay the extra to get the Stentor II because she's advancing nicely through her pieces. We are so pleased as there is such a massive jump in terms of tone compared to her previous instrument. She was so delighted with the sound of the violin that she ended up playing on it for 2.5 hours the day she received it. I would definitely recommend this instrument to anyone and would suggest paying the extra to get the Stentor II as a better sounding instrument will give a child a tremendous amount of confidence - which is important when just starting to learn an instrument. The delivery was so quick too! Definitely will use this site again for my music needs! '.